Cricket returns to Bristol for the first time in almost a month on Thursday evening, as Gloucestershire welcome Middlesex to the Brightside Ground looking to continue what has been an excellent tournament for them so far. They currently sit fourth in the South Group but, with games in hand, they remain a good bet to secure a second home quarter-final in three years. Their bowling has been particularly impressive with David Payne, Benny Howell and overseas star Andrew Tye all enjoying fantastic campaigns. The three have been excellent in their use of variations and slower-balls. Howell and Tye are also masters of the knuckleball, a delivery that has caused opposition batsmen havoc. Therefore Middlesex will have to be at their best if they are going to add to their two victories in this competition, an effort that means they are already eliminated. Their record against Gloucestershire is also particularly poor, having won only one of thirteen matches played between the teams in this format. 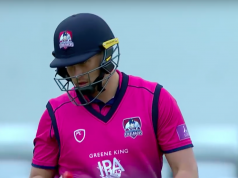 With a batting outfit that includes the likes of Eoin Morgan and Paul Stirling, however, they remain a dangerous outfit with the potential to ruin a few teams’ qualification chances – starting with Gloucestershire. While it is his opening partner Michael Klinger that usually takes the headlines, Miles Hammond has proved an excellent addition to this Gloucestershire side. Hammond, who began his career as an off-spinner, has been tasked with getting his team off to a flyer and his explosive batting style has been ideal for the role. He struck 51 from just 31 balls in Gloucestershire’s last game, against Kent, an innings that set up a successful run chase of 161. The Gloucestershire faithful will be hoping Hammond can produce further heroics on Thursday evening. James Fuller moved to Middlesex from Gloucestershire at the end of the 2015 season, but his time at Lords has been plagued by injury and a lack of opportunity. However, he has been the shining light of what has been a pretty dreadful campaign for Middlesex thus far in the Vitality Blast, picking up ten wickets. He will want to make a big impact against his former employers. Gloucestershire welcome Jack Taylor and Tom Smith back into their squad after both missed Sunday’s win at Kent, Taylor having to miss the trip to Canterbury due to concussion protocol. Their replacements for that game, Graeme van Buuren and Matt Taylor, will likely drop out of the side. Dawid Malan is back as Middlesex captain, the England batsmen with a point to prove after losing his place in the test team. Therefore Nick Gubbins drops out of the visitor’s squad, as does Tom Helm who has a stress reaction in his back. The last match played on this ground was a reduced contest, to eleven overs a side, due to the weather. There should be no such problems on Thursday evening, though, with sunshine forecast in Bristol. The wicket is quite often a slow one at the Brightside Ground, something that the hosts bowling attack enjoys with a wide array of slow and variation’s bowlers in their side.